BELTON – Linfield College forced a crucial turnover in the red zone in the closing minutes and the Wildcats held on for a 31-28 victory over the University of Mary Hardin-Baylor in an NCAA Division III National Championships Second Round game Saturday in Belton, Texas. The loss ends the Cru’s season at 11-1 and UMHB fails to advance to the NCAA Quarterfinals for the first time since the 2009 season. The Wildcats improve to 10-1 on the year and will face Widener University (12-0) in an NCAA Quarterfinal Game next Saturday. Linfield took a 7-0 lead midway through the first quarter when Mikey Arkans scooped up a Zach Anderson fumble and rolled into the end zone for the Wildcats touchdown. That was the third UMHB give-away in the first 6:30 of the game. The Cru answered two plays later when Malcolm Miller rumbled 74 yards for a touchdown to tie the game at 7-7 with 7:56 left in the first. Linfield drove 75 yards on 12 plays on the ensuing possession before Sam Riddle scored from one yard out to give the Wildcats a 14-7 lead. UMHB again fought back to tie the game when Anderson capped a 16-play, 81-yard drive with a five-yard TD run with 5:47 remaining in the first half. The Cru converted back-to-back fourth downs on that drive. Linfield would reclaim the lead when Michael Metter drilled a 46-yard field goal on the final play of the first half to make it 17-14 Wildcats at halftime. UMHB would take the opening possession of the second half and go 67 yards before Anderson hit Kamray Runnels with a 26-yard scoring strike to give the Cru its first lead of the game at 21-17 with 12:42 left in the third. Linfield rallied with Riddle touchdown passes of 57 yards to Erick Douglas III and 23 yards to Charlie Poppen on the next two drives to take the largest lead of the game at 31-21. Riddle threw both of those passes into the teeth of a strong southerly wind. UMHB would get a defensive stop late in the third quarter to force a Linfield punt into the teeth of that wind, using all three timeouts in the process. Runnels returned the ensuing punt 56 yards for a score to pull the Cru to within 31-28 with nine seconds to go in the third. Linfield missed a field goal try on the first possession of the fourth quarter, but UMHB was forced to punt the ball back to the Wildcats with 7:44 remaining. Teidrick Smith recovered a Spencer Payne fumble at the Linfield 30-yard line three plays later to give the Cru new life with 6:27 to go. UMHB drove to the Linfield 18-yard line, but Anderson’s third down pass was intercepted by Jordan Giza and returned to the Cru 44-yard line. Linfield would convert a first down and then ran out the clock to clinch the victory. UMHB ran for 205 yards and rolled up 329 yards of total offense in the game, but the Cru committed four turnovers. Linfield finished with 418 yards of total offense while committing three turnovers. The Wildcats converted nine of 18 third-down attempts while UMHB was 4-4 on fourth down tries. Miller ran for 97 yards on eight carries and he had a touchdown for UMHB. Anderson was 9-24 passing for 106 yards and a score and he ran for 45 yards and another TD. Runnels had two catches for 61 yards and a score to go with his punt return for a touchdown. 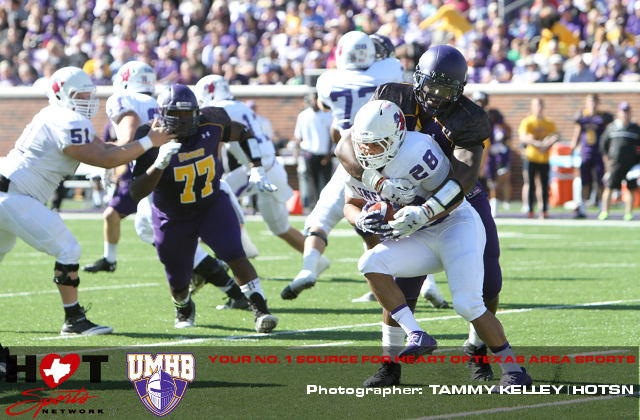 Eric Allen had a team-high 10 tackles for the Cru and Kris Brown added nine more stops. Riddle was 19-31 passing for the Wildcats for 280 yards and two scores and he added 57 rushing yards and a score on 15 carries. Levi Altringer caught six passes for 92 yards for Linfield. Alex Hoff had a huge game for the Linfield defense with 10 total tackles, 3.0 tackles for loss, a sack and a forced fumble. The game closed out the careers of 15 UMHB seniors. The Wildcats will find out the site of their Quarterfinal Game with Widener when the sites are announced Sunday afternoon. Linfield now leads the all-time series with UMHB 3-0 with all three of those victories coming in the NCAA Division III National Championships.